Folks who whiz through southern Georgia's McIntosh County on I-95 don't realize they're just minutes away from a fascinating destination: Sapelo Island. One of my all-time favorite places, Sapelo is the fourth-largest link in Georgia's chain of beautiful barrier islands, separated from the mainland by sounds, rivers and marshes. I don't know anywhere else where you can visit a marine sanctuary, tour a millionaire's mansion and a lighthouse, see a historic plantation community and enjoy a ferry ride — all in one spot! A good place to start is the Visitors Center in Meridian. Here you'll find dioramas and photos that explain the island's natural and cultural history. I learned the island was inhabited by Native Americans for over 4,000 years, then became a plantation in the early 1800s. It was subsequently owned by a succession of wealthy businessmen. The last one was tobacco magnate R. J. Reynolds, from 1933 to 1965. The only way to reach the island is via a ferry that follows tidal rivers through the salt marshes. The ferry ride alone is worth the trip — I saw pelicans and egrets along the way, and it's not unusual to see a porpoise or two splashing around the bow. After you reach the island, it's time for one of several different tours. I took the extended tour, which includes stops at the Long Tabby sugar mill ruins… the Afro-American community of Hog Hammock… the palatial Reynolds Mansion… the Sapelo Island Lighthouse… and the 34-acre Sapelo Island National Esturine Research Reserve, where you can experience a complete barrier island habitat, from forest uplands to beaches and dunes to salt marshes. When your 4-hour adventure concludes, it's time for a ferry ride back to the mainland. 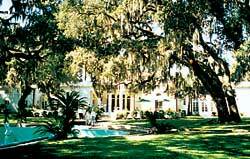 Your trip may be over, but you'll never forget the spirit of Sapelo Island! 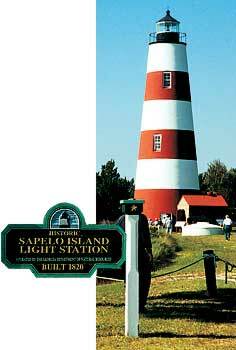 Sapelo Island is about 5 miles off the Georgia coast, roughly halfway between Savannah and Brunswick. Meridian is on State Highway 99, a few miles east of I-95. Individual tours run on Wednesdays and Saturdays, plus Fridays from June through Labor Day. Only Wednesday tours go through the Reynolds Mansion, and only Saturday tours head inside the lighthouse (also on Fridays from June through Labor Day). Reservations are required; call 1-912-437-3224. Group tours operate on Tuesdays and Thursdays, plus Fridays from September through May; call 1-912/485-2300 for reservations. The extended tour is available only on the last Tuesday of the month from March through October. Fort King George State Historic Site is located in Darien, 8 miles southwest of Meridian and 3 miles east of I-95 (Exit 49). Built in 1721, it was the southernmost outpost of England's North American empire. A nominal admission fee is charged. For more call 1-912-437-4770 or contact the McIntosh County Chamber of Commerce at 1-912-437-4192.